To completely disassemble the bolt assembly you will need a hammer, small screw driver, and a punch pin set. NOTE: If you ONLY need to change your buffer pad, don't disassemble the entire bolt... just go to the end of STEP 4 on Page 2. If you don't know how to remove your bolt from your gun please refer to the M-11 Field Strip tutorial. First get familiar with the color-coded chart I have made above. Take note of the names of the parts and there locations. If you get confused referring to this chart may help. Let's start by removing the ejector rod, marked in green, first. To remove the ejector rob just pull it towards the buffer & recoil plate. It should slide out easily. Surprisingly, the ejector rod can actually be used as a tool in the next step. Next we are going to remove the firing pin from the bolt. 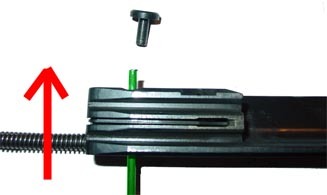 The firing pin is held in place by the firing pin retainer, marked in green. 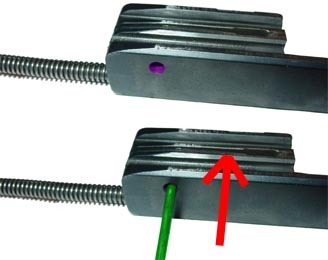 To remove the firing pin, turn the bolt around and insert your ejector rod, marked in green, or a small screwdriver, into the retainer hole, marked in purple. As you push your tool, marked in green, into the hole the retainer pin should slide out. This should not require much force, so if you have to push hard then something is wrong. Once the retainer pin has been removed you should be able to turn the bolt around and the firing pin, marked in green, should fall out.